Oak Bluffs chief of police Erik Blake is also president of the Vineyard chapter of the NAACP. The Vineyard may seem far removed from the tensions that have spurred national protests in recent weeks. But on Thursday, a group of Islanders will march in solidarity with thousands of others around the country who are demanding an end to racial violence. The march will take place in downtown Vineyard Haven and will be in the spirit of the national #BlackLivesMatter movement, which involves both social media and public protests. But it will have a broader scope, drawing attention to violence against African Americans as well as police officers. “It should be a quiet, peaceful march,” said Carrie Tankard, vice president of the Martha’s Vineyard chapter of the NAACP, who helped organize the march along with the group’s secretary, Liza Coogan. The march will be done in silence. A march was originally considered for November, following the grand jury decision in St. Louis not to indict Darren Wilson, the Ferguson, Mo. police officer who shot Michael Brown. That decision sparked national protests against police brutality and the systems that perpetuate violence against African Americans. “Then the protests started turning kind of ugly, with the looting and the burning of buildings and people getting hurt,” said Erik Blake, chief of police in Oak Bluffs and president of the Island NAACP. 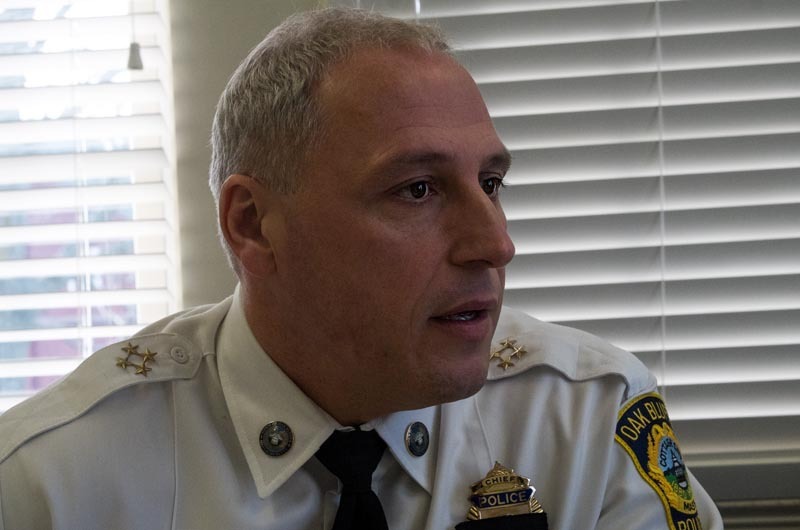 “So we put it off for a little bit.” Mr. Blake was until recently the president of the Massachusetts Chiefs of Police Association, giving him a unique perspective on issues surrounding racial profiling. Following the murder of two New York city police officers earlier this month, plans for the march took another turn. Mr. Blake said many NAACP members had reached out to him, and the message people wanted to create on the Vineyard is that all lives matter. “People will be holding both signs: ‘All Lives Matter’ and ‘Black Lives Matter,’” Mr. Blake said. The march will begin at noon on Jan. 1, at Five Corners in Vineyard Haven. It will then head west on State Road, continue down Main street and Union street, and end at the parking lot across from the Steamship Authority. If the group includes more than 50 people, they will be allowed to march in the street, but otherwise will need to stay on the sidewalks. Mr. Blake expects between 75 and 100 people to join the march. Despite moments of racial tension over the last few decades, Mr. Blake said he was unaware of any federal action regarding civil rights and law enforcement on the Vineyard. But the potential for bias is something his department takes seriously. Several years ago, a state-run training program for town police departments focused on fairness and impartiality in policing. It began at the top, by training chiefs and instructors, but funding was pulled before the training was able to reach the level of the patrolman. The Oak Bluffs police department is now planning to launch a similar program independently. Concerns about racial profiling on the Vineyard have centered around the Brazilian immigrant population, Mr. Blake said. But he said that was at least partly due to a misperception that local police departments were deporting illegal immigrants. “What we found too was that [members of] the Brazilian community weren’t coming forward when they were victims of crimes,” Mr. Blake said. The department has sought to clarify that a person’s immigration status does not influence the enforcement of state law. Thursday’s march is an opportunity for the NAACP to take a more public stance on racial profiling, as well as violence against police officers, and to add its voice to the wider cause. As for law enforcement, Mr. Blake said the issue comes down to legitimacy. “People voluntarily follow the law because they feel the people enforcing it are legitimate,” he said. I will have my own sign and T-Shirt. Both will say -- "Breath Easy" "Dont Brake the Law". Not very original, and not very responsive to the message the organizers are trying to communicate. And it's "break," by the way. I hope you haven't already ordered your shirt from the screen printer yet, but that would be perfect. One other correction before you order your shirts. Its "breathe easy", not "breath easy". Take it easy, it is the intent that counts here. Did you guys know that Einstein couldn't spell? I've never been shot or even arrested by the police. I wonder why that is... oh yeah I'm a law abiding citizen. Try it, it works!!! Abiding the law works. I don't understand when people are looting their own town, same during Katrina; and want to be taken seriously. to JJ -- I don't know where you've lived other than here, but I have lived in big urban centers around the world before i finally "landed" here. I can tell you that bigotry amongst certain elements of law enforcement is universal and in many cases can be deadly -- law abiding or not. Most cops do a great job under extraordinarily difficult circumstances. But there is a culture of mistrust and in several cases, fear, in many police departments towards African American men. It is tragic that a young African American man has to be taught to distrust the very people paid to protect him no matter this young man's class, education, etc. I'm not making this up. It is a sad part of American life. I believe we are exceptionally lucky to have police departments totally integrated into the community which means so much to everybody. But that fact doesn't deny what goes on in much more anonymous urban environments. You probably arent black or poor either. Half the country makes less than 28k. They dont buy new cars every year. They tend to drive vehicles 10 plus years old. So following all the laws sometimes put a financial burden on these people that others dont feel.Some laws are just wrong and you need to stand up. Arresting someone for selling single cigs is just wrong. Many black folks have literally declared WAR on police officers, whites and even firemen in some instances throughout our country. Black on white violence is and has gone thu the roof for many years now and the black Hon. James David Manning, PhD continues speaking about the Patrick Henry style revolution coming. Maybe things can begin to change here on Martha's Vineyard as many of us didnt grow up here like that but things have spread here as has many other not so helpful issues. Having a token white NAACP president who is also the OB Chief of Police here would be a great place to start. Just curious why the planned march is in Vineyard Haven and not in Oak Bluffs or Edgartown? The events of the last few months have certainly sparked a national dialogue. In this time I've heard arguments on both side of the spectrum. Some have been well founded, however, many have clearly been shaped by mass media and bad information. In the case of Michael Brown, there is some 4,000 pages of testimony available online. No matter ones opinion, I encourage everyone to go online and read it all. Page by page; after all knowledge is power. Ridiculous....In a community that has a record.historically.of respecting and integrating with our black community on the Island.....Why not celebrate that fact instead?!! Shame on those who participate, they are called race baiters! Liberals see themselves as a constant solution waiting for a problem. You're right, the island has quite a positive history of African American and white cooperation and mutual respect. Depending on how you look at it, this march actually is a celebration of that relationship and a showing of hope that the rest of the country could have a similar relationship. Seeing the march in a negative light is your own choice. Salute to Chief Blake for his community engagement efforts. Much to say about an island community like MV showing support for police officers and all citizens. If you work together, you succeed together; if you understand each other, you communicate better; if you respect each other, all lives matter. Thanks MV for showing America how it is done. I will be silently marching with you! I'm very proud to see that MV will be doing this the right way. When we marched in Washington, DC, I heard only one person yelling about violence. He was completely ignored. That was out of tens of thousands of young, old, black, white and Asian peaceful, respectful participants. The rhetoric of anger, even in forums always seems comes anonymously from someplace in the back of the pack. Thank you Erik. Thank you Carrie. Thank you Lisa. This is leadership. I believe this is wonderful and a great way to start dialogue. If you don't stand for something, you stand for nothing. #AllLivesMatter. In the 1920s and ’30s, black families could not buy property in Edgartown.